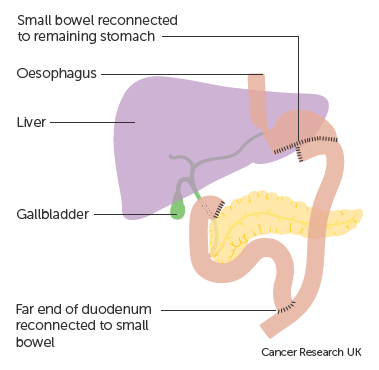 Find out about the different types of surgery for stomach cancer. 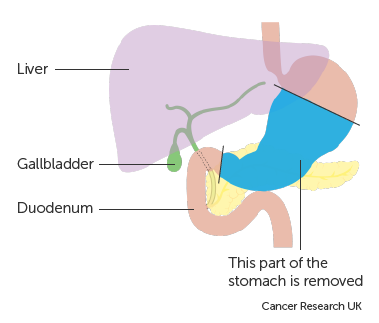 The type of surgery you need for cancer of the stomach depends on which part of the stomach the cancer is in. 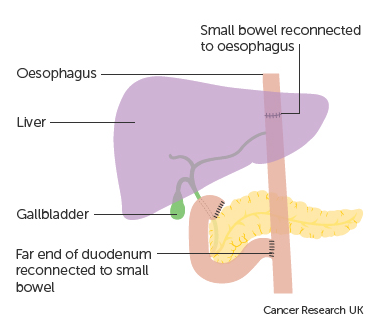 Operations to remove stomach cancer are major surgery. You have them under general anaesthetic. You’ll be asleep for the whole operation. You’ll need to travel to a specialist centre to have your surgery. 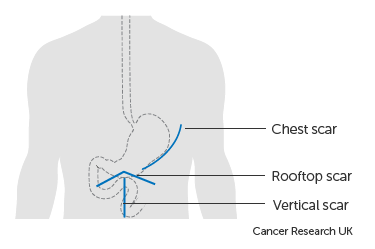 For very early small cancers (stage 1A) your doctor may be able to remove the lining of your stomach. Your surgeon removes this using a long flexible tube (endoscope). The procedure is called an endoscopic mucosal resection (EMR). 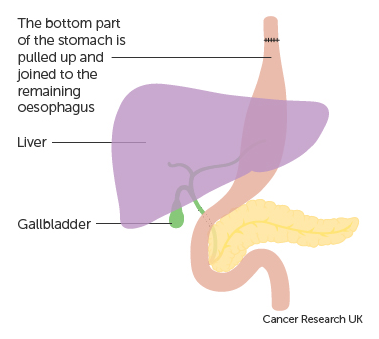 Your surgeon may remove up to two thirds of your stomach if the cancer is at the lower end of your stomach. This is a subtotal gastrectomy. How much the surgeon removes depends on the position of the cancer. The surgeon will also remove part of the sheet of tissue that holds the stomach in place (omentum). You’ll have a smaller stomach afterwards. The valve (cardiac sphincter) between your food pipe (oesophagus) and stomach will still be there. This operation is for when the cancer is in the middle of the stomach. The surgeon removes the whole stomach and all of the omentum. This is a total gastrectomy with a Roux-en-Y reconstruction. Your surgeon rejoins your food pipe (oesophagus) to your duodenum. 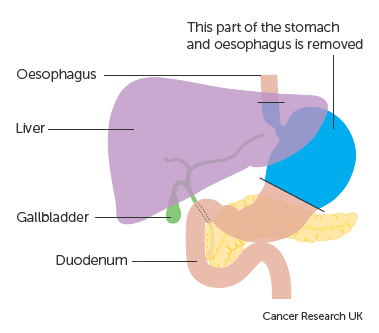 This operation is for cancer that is in the area where the stomach joins the food pipe (oesophagus). The surgeon removes your stomach and part of your food pipe. This is an oesophagogastrectomy. Your surgeon keeps the lowest third of your stomach and makes it into a tube. They rejoin this tube with the remaining part of your food pipe. During your operation the surgeon examines the stomach and surrounding area. They take out all of the lymph nodes from around your stomach and along the main blood vessels to the stomach. The surgeon takes out lymph nodes in case they contain cancer cells that have spread from the main cancer. 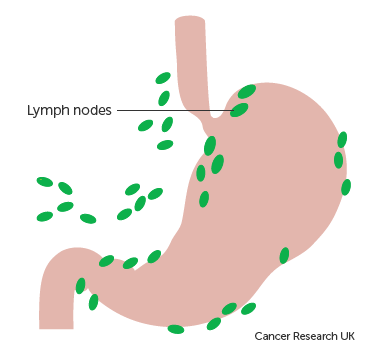 Taking the nodes out reduces the risk of your cancer coming back in the future. It also helps your doctor to decide if you need chemotherapy after your surgery. The number of lymph nodes your surgeon removes varies. For people who are less fit the surgeon may only remove the lymph nodes closest to the stomach. 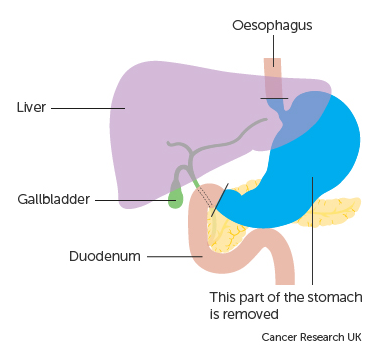 To remove cancer of the stomach you may have open surgery or keyhole surgery. Most people have open surgery. Keyhole surgery is also called minimal access surgery or laparoscopic surgery. It means having an operation without needing a major cut in your tummy (abdomen). It is possible for a surgeon to remove the whole of your stomach, or part of it, using keyhole surgery. You have this type of surgery in specialist centres by a specially trained surgeon. The surgeon makes 4 to 6 small cuts in your tummy. They use a long tube called a laparoscope. The laparoscope connects to a fibre optic camera. This shows pictures of the inside of the body on a video screen. The surgeon then uses the other incisions to put the other instruments they use to do the surgery into your body. Using the laparoscope and other instruments, the surgeon frees the stomach so they can remove either all or part of it. They then either join the remaining stomach to the bowel or your oesophagus to your bowel if they removed your whole stomach. Laparoscopic surgery takes 30 to 60 minutes longer than the more common ways of removing the stomach (open surgery). Researchers are looking into whether keyhole surgery is as good as open surgery.